I think the best way in order to learn all aspects of one thing is to go to its origins. I also just finished my studies past summer. Thus, before entering the professional life, I wanted to spend some time, with an original experience in both mental and physical terms, to think about my future life. First, this whole experience in Kunyu academy was really great and original. It gave me some time to think about my future life and get a better physical and mental condition after long and hard studies, especially my last year. Moreover, thanks to these three months, I could better open my eyes on Chinese culture and philosophy, which will be big gains for my future if we take account China is very linked to the globalization and all world business. Also, because I really enjoy sport and challenges, some aspects like motivation, determination, etc. have all their meaning here, which is important. Masters and translators really helped me to enjoy my experience. Translators were efficient in their work and, as Shi Fu, took care of students. I can now tell without hesitation I progressed during the three last months, in both mental and physical terms. And even when my right knee stopped my training time, they all found the good way in order I continue to enjoy the time I was spending there. An important point about my experience was also, for sure, the environment. I never went to Yantai but mountains, in summer as in winter, offered me a great view, which stimulated training times. Mountain run, big mountain run, training at lake, etc. even if these are not easy, offered me serenity and good break compared to a city daily life. Energy came back.Thank you to all of the academy staff! 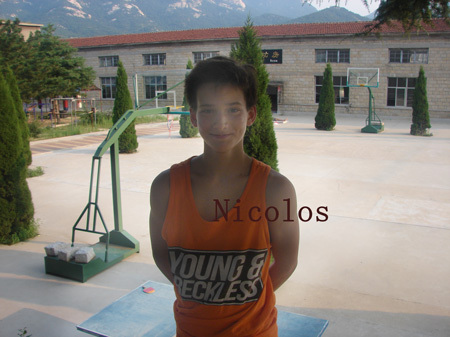 I came to China because it is the birth place of Chinese Kung Fu, and I wanted to see what it would be like to train here.There are many things I have gained from my time here, but the greatest gain would be I am a lot more fit, and flexible than I have ever been.I think I was most influenced by my master and by the other students in my group. They kept encouraging me and push me into improving myself, both physically and mentally. I really enjoy me time in the academy. I met a lot of people, many of which are from countries I have never been to. Everyone was very nice and helpful, especially the translators. Being able to train at least 4 hours a day under such great master has been a great experience. Even on power training and power stretching days. One of the things I really like about being here was the view of mountains everyday. Although the mountain running was quite exhausting, it gave me the opportunity to have an incredible view every week. I could have ended up anywhere, all I wanted was to travel, meet new people, get to know a new culture and train martial arts,then,I choose to go China to study Chinese kung fu. This journey has humbled me, taught me the value of an open mind and respect for both other people and their thoughts.Obviously my new friends are in China, the students and translators have helped me a lot. But my master has probably been my greatest influence. He taught me more about respect and manners, but also showed me that no matter how big of a culture and background difference we have friendship is possible. He also taught me about hard work, discipline and he showed that he believed in me which made my training are so much more fun. I saw it on TV many years ago that people went to China and trained Kung fu, and one day I randomly found your webpage and ended up in China. I want to travel, see a new culture, and practice martial arts.My physical condition is better and I have more of an open mind now than when I first came here.Everyone I meet influence me in one way or the other but I think my Shifu influenced me the most. He believes in his students and that makes the training so more fun and rewarding. He taught me about respect and good manners, discipline and hard work and I truly appreciate our relationship. Training here has been very rewarding and I think the training part of my stay here has been perfect. I like all the masters but especially young Gao and of course my master. Gao always smiles, is happy and creates a good environment even for students that are not in his group.The translators are always there if you need anything and really appreciate them. They do a very good job.. I wanted to come to the home of Kong Fu, China, to conduct my training. 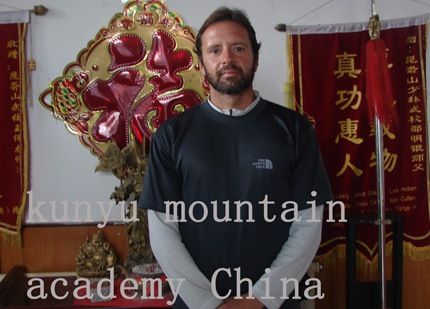 I contacted a number of Academies in China and received the best support from Kunyu Mountain Academy. I get a healthier lifestyle, many new training techniques and a love for Shaolin Kung Fu forms.My master has been fantastic. He is an awesome master, a great trainer and a very, very nice person. If I were to come back in the future I would want to train under Master Xu. All of the other members of staff have been very helpful especially the translators. Being an older student I was very grateful to Master for tailoring the training to my limit. The training has definitely enhanced the rest of my life. The school atmosphere is excellent and I have enjoyed the “family” spirit in the school. The daily routine is well planned and excited by the masters and translators.The academy is located in one of the world’s most beautiful locations, I enjoyed the national park at weekends and feel that it lifts the Kunyu Mountian Martial Arts Academy above another school. Because China is the birthplace of Kung fu and I wanted to learn about the culture and tradition as well. I was motivated by wanting to do an once-in-a-lifetime thing; to improve my body and mind. The greatest gain is my physical improvement from the training, my mental improvement, and learning mandarin.Master Xu, above all, influenced me most. A brilliant master, with phenomenal martial arts and excellent spirit. I have learnt much and hope to show some of his qualities in my life. Also all the translators, very friendly and helpful! Also older students like Alex, Russell, who train hard and gave me a target to work towards.It was amazing. The training was very hard, and when I first arrived my body was not used to it, but I love it. In fact, the harder it was, the more I enjoyed it. There were times when I wanted Master Xu to push me harder to make me do things better (or lower or higher or faster), but it was good having to push myself. I really liked learning about the spirit of Kung fu. The surroundings were one of the best things about my time here—especially the mountains and lakes. I loved doing chi gong of the mountain on Wednesday mornings, and going for walks and doing it at the weekends. The clean air was very nice.Thank you for my time here. Lochlann (from Australia)-returning student who learnt for four month in 2011 and returned this Aug to Nov for another three months study. I am a returning student to Kun Yu mountain, having trained here for a few months in 2011. I wanted to come back because the training is really hard and the life so peaceful. My master is an excellent teacher of Mantis Kung Fu. He is very patient with me and has grown to know my limits, but is always trying to push me to do my best. He always manages to make Mantis feel like a family rather than a group of strangers training together. Returning student,this is second time to come to study Mantis. Since I was a child, I have been fascinated with Kung Fu and as I got older and practiced different disciplines, I realized I wanted to learn in the birthplace of most martial arts and wanted to have a real experience in its lifestyle. There has been a lot from the focus of making this my life to patients in others and myself. Mantis Master has been a great influence in both my trainings and in my personal life. There are also all my kung fu brother and sisters that I know I will be close to for the rest of my life.Trainings and daily life in the academy is different, each time I have come out here the first five months was getting to know the mountains and the city and getting to know mantis Master and mantis style kung fu and falling in love with its training and application. Trainings have been amazing from the beginning. I wish I could go back to training like in those days. The translators are always great and very helpful and the link between us and the Shifu. So thank you for that and making our stay in China easier. The masters ---- learned from all of them a lot and shaped me to the person I have turned into. I chose China to study Kung fu because China is the originator of kung fu. I also wanted to learn for an authentic place. What motivated me the most to come to China was to learn how to defend myself and to lose weight. My greatest gain from coming to this martial arts academy was my overall fitness and flexibility which drastically elevated. My Wing chun master was unquestionably was the biggest influence on me, but my peers were also a good influence on me too.My overall experience at Kunyu mountain academy was awesome; the training is great and very fun. The masters are all very helpful and patient with all the students. The translators are also very helpful, kind and are easily understood. The scenery of this academy is categorically stunning; the lakes are beautiful and are very refreshing to swim in after a hard day of training. The mountains are spectacular to look at and will never get old to look at. 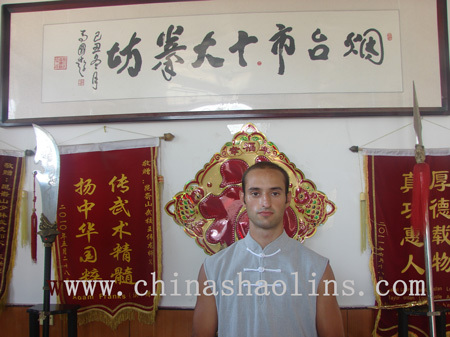 Andre spent one year to study Wing chun in Kunyu mountain. 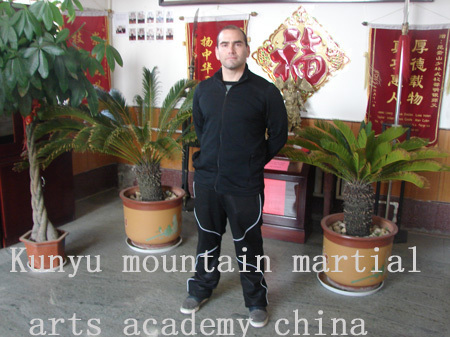 I wanted to discover China through activities and so I chose the martial arts. I wanted to do Tai Chi and Chi gong for fear of not being able to follow other courses. But in the end, I did shaolin kung fu and I don’t regret it. 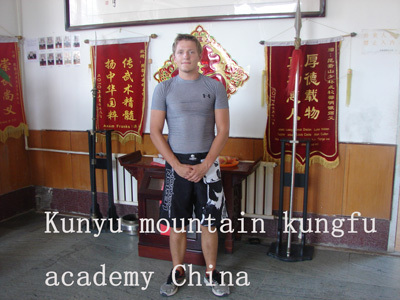 Studying martial arts in kunyu mountain academy can quickly understand the spirit of kungfu and can improve everyday. The friendly atmosphere, the mentality of all the students, the help between students grows everyday to the best of us. The masters can adapt to your strengths and your weaknesses. I also thank him for his patience. Life at the academy is punctuated by the workout. The days and weeks go by very quickly. I spent 3 months here and it seems too short. I still have so much to learn. Masters have a lot to give us and sometimes translators are not enough in number and perfect enough to translate every word. I enjoyed my stay here and I would like to improve myself again. So I will come back. Two month kung fu course from Aug to Oct. I wanted to discover Kung Fu in China in its original country to have a real life time experience. My greater gain would be that I realize though martial arts that I can always push my limits. Nothing is impossible. I like My master, old students, and the translators.My experience in kunyu martial arts academy was over all very good. I enjoyed the training every day. I learned a lot. Thanks to my masters. Daily life was also very good: people, including translators, are very nice and helpful. I think the surroundings are lovely. I love the nature and the peace and the mountain. The lake was very nice in common. Thank you for this experiences. My experience here at the kunyu academy was good. I really enjoyed it. The training in mantis group was really good. The masters were all pretty nice and helpful. My master was incredible. The translators were all very kind and ready to help the students if they had a problem. I wanted to get the full experience of studying martial arts in an area where it originated from,then,I came to China. What motivated me was, well I always wanted to do it when I was a kid. But I never ended up doing it. So I decided to go to China and give it a try. I did want to get in better shape too which helped. Well, my greatest gain from my training is probably a good balance between my mind and body. It also helped with patience discipline and my overall fitness. Well when I first arrived here a lot of people helped me out in mantis group. The other students really helped me out and my master did an amazing job at teaching me.The surroundings of the academy I enjoyed well I was here the mountains are really beautiful to look at. The lakes and water falls were also very nice. Yantai was a nice city to hang out in on the weekends if you got board here at the academy. That’s pretty much it. Brandon studied for one year. I have always wanted to study Kungfu, but didn’t realize it was possible. One of my brothers friends told me about it was he went to China to study Kungfu, this motivated me to contact a school in China,then,I went to Kunyu mountain academy to study kung fu here. Training here was hard at first but slowly over time it become more and more enjoyable, and I was able to do more and more. 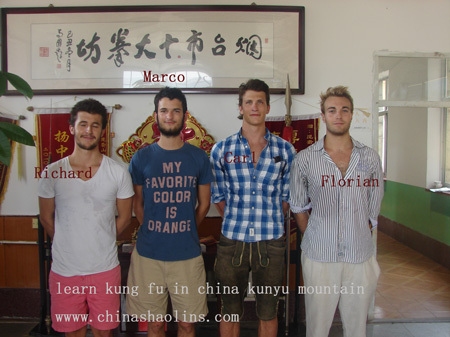 I chose to study kung fu in China because I wanted a new and different experience to my past. My weight gain over the last year was my greatest motivation to learn kung fu and help discipline my mind into a healthier lifestyle. A growing interest in kung fu as well as the application of kung fu in self-defense also highly appealed to me. My greatest gain from this academy is the ability to discipline myself to exercise regularly and be able to give energy to every task given to me.Furthermore, one of my gain goals was to lose weight and be able to build a foundation to a healthy lifestyle when I return home. My other gains have been working with my master and to be able to learn different ways to go about training. What I have learnt from my fellow peers (my group) and shi fu is the ability to be self-disciplined, self-motivated and strong-willed, which all abilities I will be able to use in everyday obstacles. The ability to keep going when I have wanted to just stop is also another key skill I have learnt. My master has been my greatest influence, along with my fellow group mates. My master has had lots of patience with me, as well as motivating me along every obstacle I have come across. My master was strict when needed and was helpful and kind at other times. He has helped me achieve what I came to kunyu academy for. He has made me realize that I can push myself past my limits and has helped me achieve a greater level of fitness. I would like to wish my master all the best. My experience has been very good; I have met a lot of new and different people who have achieved their own personal goals. All of the masters have been friendly and helpful. I found training very difficult but very necessary and I found it very good. The food was good for lunch but dinner was not good. The translators were very helpful during my time here. Nancy, who pick me up from the airport was also very friendly and started our time at the kunyu academy very well. Rose and Larry were also very good. Jay and Prave have also helped me through training because they are like my family. Jay and Prave have talked a lot of nice things about their masters and I wish all the masters the best in the future. Yantai is a very beautiful city and is surrounded by beautiful things. Rafael Dreer (Brazil)Rafael will return in Feb 2014 for another 4 month study. Because Kung Fu had its origin in China and it’s the most traditional country to learn this ancient art. I always had a lot of will to learn Kung Fu. Because of its physical and mental aspects, and I finally had the opportunity. I benefited Mental training, especially focus and concentration, which Chi Gong helped a lot, and development of flexibility and Sanda skills. I like my master and all the colleagues from my group, my roommates and other friends that I made in the academy during the period. And also all the translators: Nancy, Rose, Larry and Rachel. And Shi fu Gao in my last training week. I could improve a lot my flexibility, some fighting skills and now I can do some things with my body that I couldn’t expect to do. I think I leave this experience much stronger, especially my mental strength. Usually I woke up everyday at 5:30 for Tai chi and Chi gong classes. Had the morning training session, a brief rest after Chi gong session in the afternoon session. I spent most of my evening time just resting and reading. 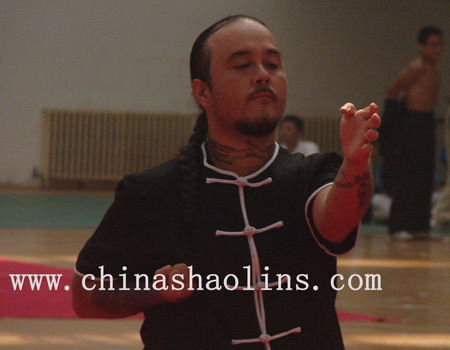 My master helped me a lot to correct skills and positioning, in Shaolin training and also Tai chi. He always motivated me to do in the proper way. All the translators were very helpful every time that I need assistant to something. All of them were great. And master Gao helped me a lot too, especially with forms and Sanda skills in my last week. The atmosphere in the school is very nice and the entire region is calm, peaceful and beautiful, something that I was looking for. The temple and the cave are very pleasant as well, the air is fresh. I originally choose to study Kung Fu in China for two reasons, the first being I always wanted to study Kung Fu in China as it was an ambition of mine, watching Bruce Lee inspire me. The second reason is two friends of mine, Mariharan and Luxaman, came to Kunyu mountain in 2008 and I saw that they lost a lot of weight. Due to me being overweight, I felt coming to Kunyushan like my friends would help me lose weight and become more focused in life. My greatest gain would definitely be losing a lot of weight, when I came to China, I weighted 106kg and leaving Kunyushan, I now weight 86kg! This was my main goal, however I feel the I have improved well in Kung Fu from when I started especially in kicking, something I could not do because my size. Anther great gain is my flexibility, which I feel I have improved greatly on since I have come and has inspired me to continue to become more flexible. Another great gain which could even be my most important gain is mentally I have become more focused, I don’t feel lazy anymore, I feel very strong willed now. My main influence was my master, my master has truly inspired me physically and mentally! I still remember the first day I arrived after the power training the master said “If you are a quitter in life, you won’t succeed.” This is now a quote I will live by, truly inspirational. My master has been very patient with me, which I liked. I have complete belief that the master will go on to become an outstanding master, potentially one of the best, not only because of his outspoken Kung Fu skills, but due to his mentality. Always telling me “I am the best” and “Don’t give up,” when I felt I couldn’t continue, made me believe in myself. This is a mentality that I will continue to have thanks to my master. I have so much to thank him more. When I leave the camp (academy) I leave with not only a new master but a great friend, who is welcome to come see me in London wherever he wants with open arms. A great help came from all my classmates (group mates), people like David, Gleb and Pascal helped me greatly, with setting in and treating me as a part of the family, a family which my master built very well. Watching the students helped and inspired me too. After a couple of days I felt very settled in and comfortable mainly thanks to other students who were very helpful. Training was very hard but at the same time enjoyable. Thanks to the master, I particularly enjoyed Sanda, power training and power stretching. Power training helped me lose a lot of weight and power stretching helped me get flexible. I didn’t enjoy forms at first but once I started Tongbi form, I really enjoyed form class, especially staff form. I like how master made us perform in front of class, it made me more confident! I love the translators Nancy, Rose and Larry and Sarah were very friendly and very good, and helped us settle in very well. The master as said before was incredible, really helped me. I like the other masters a lot too, I heard a lot of praise from Prov and Grish about their master and I’m sure they feel the same about their master. The surroundings of the camp were great, loved just being in the lake, felt very peaceful. The waterfall was great as well. The mountains were very nice scenic and beautiful and I have some great memories to take with me especially the big mountain run. Yantai is great too, very nice city although I only really explore it near the end of time. Overall I loved the camp, master and translators and the students. I will never forget this place and will be sure to come back if I have the time! 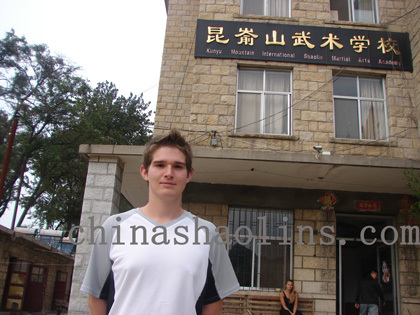 Robin Schiewer (Germany ) Four weeks study in Kunyu mountain. The origin of Shaolin Kungfu is in China, so here is the best place to study it. It was amazing to experience and see all the different aspects of China in my daily life. I really appreciated the training here and the high level of professionalism. The translators are helpful and polite, after some days, life in the academy feels almost like living in a big family. I really like the terrain around kunyu mountain academy; it supported me during my studies. Yantai city is too big and overwhelmed in my eyes, but still interesting to visit. I liked the Yantai city. 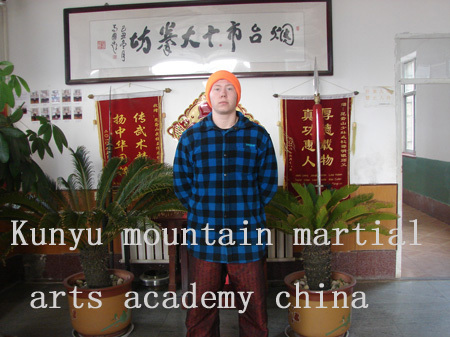 Ulrich returned to Kunyu mountain shaolin martial arts academy. 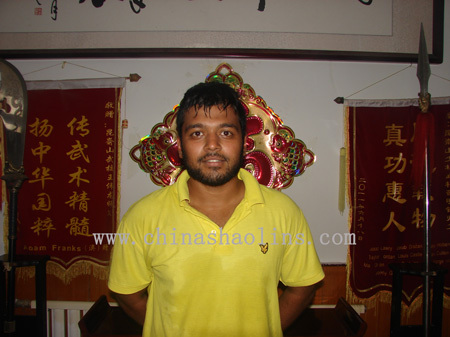 Kunyu mountain shaolin kung fu school China Reviews-Returning student who learnt three months in last year. Two months Course from Aug to September 2013. I have been here already last year and I wanted to go on studying Mantis. I learned what it means to train hard, as well as going beyond my limits. It was also very interesting to join the massage, to learn how to fix disease, which something really appreciated. My master is the person who influence and helped me the most, because it is really awesome to see how fast and precise he can do his performances. He really pushed me hard, but that’s really good, through that I have improved a lot. But it’s also very impressive to see the long-term students, whose skills are really good too. Normally you should stand up at 05:30, do a little warm up, then go for Taichi and Chigong followed by the breakfast, after it you have a break, where you have to clean your room. At 08:30 the main training starts which lasts until10:00 followed by 30min break, then training from 10:30-11:30. The lunch is at 12:00 followed by 2.5 breaks. The afternoon training starts at 14:30 and lasts till 16:00 half an hour break followed by Chigong and Taichi. 17:30 is dinner; afterwards you can to to optional classes as mandarin or massage. One of the best parts of the school is the surrounding nature; it’s really beautiful with the leaves and the mountains. Yantai is very good too, because you can go there to have coffee and western food. Because China is the birthplace of Kung Fu. 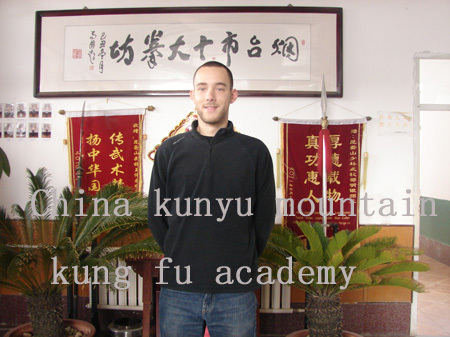 I want to teach in my country,so I came to kunyu mountain kung fu academy to study kung fu here for one year.. I improve a lot my martial arts basics and learn different styles and advanced techniques. 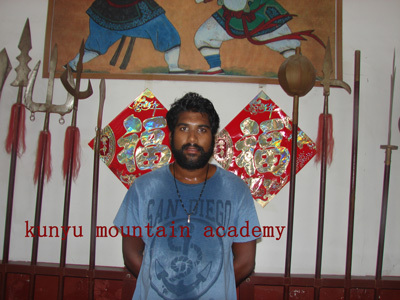 Masters here at kunyu mountain academy are awesome.Kunyu mountain are very nice and relaxing. Perfect for being away from home and have time to think about yourself. I wanted to train with a real shaolin monk,so I came to kunyu mountain shaolin kung fu academy to study. The greatest gain is the mind set that I got from my master, my body got strong as well and I feel more confident. The older students helped me a lot, especially in the beginning with all the basics but at the end my biggest help was my shaolin kung fu master。 I could see that he has an amazing experience of life and he always showed me respect, like I did for him. If I hadn’t stay for a long term study I probably wouldn’t feel like at home, but the academy and the student’s, as well the master’s because like family for me. It’s like a place I could go if I would have problems or feeling alone. There was never a time that my master, friends, or translators didn’t help me, that’s why I’m thankful. The surroundings of the kunyu academy are great. The mountains are beautiful and the lake is a good way to get refreshed and for swimming. The nature around is amazing, here you can actually feel free. Sometimes it get’s really hot but we have the lake. If we need to buy some extra food or just go out for dinner, Muping or Yantai are the perfect places for or wishes. Thank you, you allowed me to make one of my dreams become true. 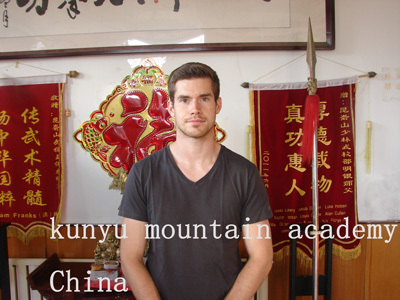 Andre stayed in kunyu mountain for six month to study kung fu here. I hope ever visited China and Asia. This is why I chose to study the martial arts. I was always wondered to old China,after we heard lots of great reviews of Kunyu mountain shaolin martial arts academy,then,we came here to learn kung fu and explore Chinese culture. I have gained tremendously from my cardio and muscle training. In my opinion Taichi and Chichong were very helpful for ones mind. Our master helps as through every problem we had, as well as the translators. The office showers were very helpful as well. Our master helped us a lot. The chinese martial arts training was great. The qualities of the English translators were very good. The surroundings here are beautiful. The mountain is lovely and lake is wonderful, for relaxing after the hard training all day. Yantai is a nice city as well. It is great to this have this experience. Thank everyone in kunyu academy for a wonderful experience. I always wanted to broaden my horizon and discover the Asian culture. Also I could finally learn martial arts. Through the kung fu training here,we benefited physical strength and showing I discipline. All the translators and especially my master! Thanks a lot. When I arrived here a month ago I was surprised to a positive way. I and my friends had great luck to have our master, the training was very hard of the beginning, but after two weeks we could all focus on our forms. Lovely! The way to the lake is important for the relaxing atmosphere. I really love kung fu training with our master. It is very good always here for help and to push your limits, but he also knew our limits pretty well and was very kind. The translators were good (best one was Larry!). My decision to study Kung Fu came from a need to seek out a new challenge in my life; the motivation that I needed journey out to China came from my curiosity of this world. I am an artist and wanted to explore the ancient and theatrical Kung Fu. I learned a lot from China Kung Fu. The main thing is that I learned just that much dedication and focus learning will move your own body requires then once your muscles get the motion your mind has to study focused to perfect it. My Shifu master was very inspirational to me during my time of Kunyu mountain kung fu academy. He is a great example of a man. I also relied on the fellow students a lot to show me and help me. My training was very intense and my body has changed for the better because of how hard the training was. I felt like the other student were the key in motivating me and the others. The school has done a great job of creating a positive environment for training.I like Yantai and the natural atmosphere of Kunyu Mountain (Kunyu shan)! Thank you, I had a wonderful time! I’ve always wanted to learn Kungfu in China since I was a little girl, because I grew up watching Kungfu series and movies. After coming here, I realize you learn a lot more than just physical attributes and strengths. I gain a greater understanding of how the mind and body works, especially in regard to how the mind has contact over the body regardless of your physical state. I’ve also learned proper breathing techniques, which became one of the most useful aspects of training. In both Shaolin and mantis groups, the classmates have been very helpful, especially in mantis. my master has been a great master to me and I have the utmost respect for him, not only for the things he taught me, but also the way he is. In one way or another, all the other old students have been patient and kind towards me and have guided me along my stay here. They’ve taught me so much in many different aspects that I was: my experience and gains would not be as significant if it weren’t for them. Training is probably the hardest, physically demanding actually I have ever done in my life, yet I have enjoyed almost every minute of it. The people I met here are incredible and because of them, master and training; this is easily one of experiences of my life to date. Mountains and the lake are beautiful, and Yantai is a fun city. the school is a great place and I look forward to studying more from my master in the future. I have always had an interest in Martial Arts since I was young, also, a passion for fitness training and pushing myself as hard as I can, so coming to China for 1 year to train 24/7 really appealed to me. I really enjoyed my time here studying WingChun, Baji and tai chi, but later discovered that tai chi was/is my favourite style, and therefore progressed further with that than the other styles. Training here also helped me increase my knowledge of other training methods, as I found body weight training to be most effective, relative to martial arts fitness. My biggest influence here would have to be a member of the WingChun group, when I arrived he was class monitor and trained exceptionally hard in class, it's always good to find someone to train with and to follow. Daily life in the academy remained the same throughout my time here. I enjoyed myself, but it would be nice to see more variation in the training received.As a result of this, I found that I had plenty of energy to do my own additional strength training every lunchtime, summer and winter, this helped greatly to improving my strengths and weaknesses. All the Masters were very friendly, helpful and if you had a question or a request they would do their best to answer. The translators were also very helpful, particularly the senior translators, Nancy and Sarah, as they know more about what goes on in the academy. As for location, the mountains are stunning with a lake nearby for swimming in the summer time. You do feel as though you are in the middle of nowhere, with apple farms and local farmers using very rustic equipment. I personally didn't visit Yantai very much, but the local town of Muping always satisfied my needs. Overall I had a great time here and would love to return in the future. 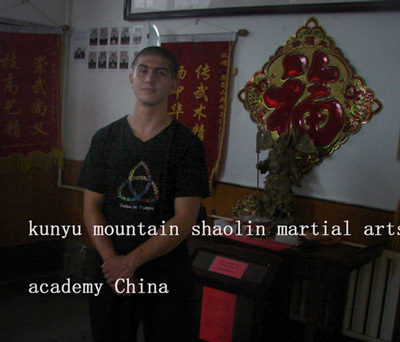 Adam is one of excellent students in Kunyu mountain shaolin martial arts academy. 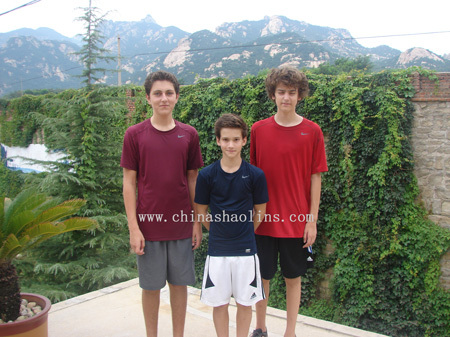 Kids team stayed for one month from July to Aug to learn Chinese kung fu and culture here. I believe that studying Kung Fu in China is the best way that somebody can learn Kung Fu. Kung Fu from where I come, the United States of America is not as authentic or pure. Kung Fu began in China; therefore, training and practicing Kung Fu in China is the best place to learn the martial arts. I have learned a great deal of discipline whilst training here. I have also become wiser, due to the time given to think, through meditation. I wake up with my two cousins. Sometimes I did Taichi. Then I eat breakfast. Then, I train, my master helps me improve. Then, I have a 30 minute break and train some more. Later, after lunch and about two hours to rest, I train again. Later, I relax, and then eat dinner. Then, I sleep. My master is very kind. He helps me learn a lot. The translators are very nice. They help make me feel comfortable. I love the surroundings, and the Yantai city. The lake is wonderful. The mountains are amazing. Thank you to everybody at the Kunyu Moutain Shaolin Martial Arts Academy. They will be missed greatly. China is the birthplace of Kungfu and we felt it was appropriate to study in China. my gained flexibility and my endurance for training. My training was difficult,but I LIKE. The translators are very nice and very good at speaking English. My master made improve very much and was a big help through my stay. Yantai city is very nice and the AEON mall is very useful. The mountains and lakes are beautiful sights. I chose China because it is the birthplace of kungfu. I was motivated by the health and peace kungfu brings. I got Discipline and peacefulness through training in kunyu academy. My wing chun masters helped me the most, he is not only a great master but also a great man who taught me a lot. Old students like Scott, Sam were a great help too. Sarah, the translator is an amazing person, always goes out of her way to help us all. My experience here was the best time in my life. I came here for a better life style and a career which would obligate me to maintain that better lifestyle. I received what I wanted here and more, I got a second family, from the staff to the translators and masters. Everyone has showed me concern and compassion. Everyone here is friendly and kind and would help you with anything they could. My master is an amazing kunfu master and person. He could motivate you with two words “ come on”. He is kind, patient and very inspirational. I look forward to coming back as much as possible to train under him again. Yantai is a very beautiful city, the mountains and surroundings of our school are very peaceful and quiet, great for the training. 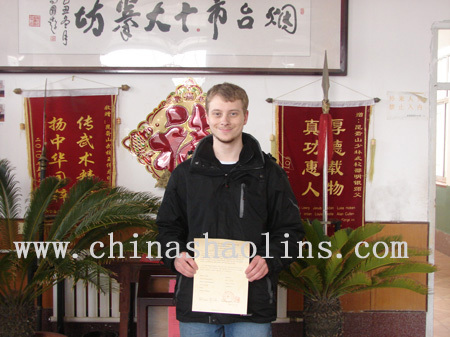 Jeff took part in the July and August 2013 International Traditional martial arts competitions held by Yantai city,and got great records.